Join us for a small-group, informal discussion with Richard Harris about the culture of biomedical research and its effect on scientific rigor. Richard Harris has covered science, medicine and the environment for National Public Radio since 1986. 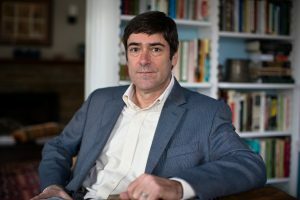 His award-winning work includes reports in 2010 that revealed the US Government was vastly underestimating the amount of oil spilling from the Macondo blowout in the Gulf of Mexico. He also shared a Peabody award with colleague Rebecca Perl for their 1994 reports about the tobacco industry’s secret documents, which showed that company scientists were well aware of the hazards of smoking.Richard has traveled the world, from the South Pole and the Great Barrier Reef to the Arctic Ocean, reporting on climate change. The American Geophysical Union honored him with a Presidential Citation for Science and Society.In 2014, he turned his attention back to biomedical research and came to realize how the field was suffering. Too many scientists were chasing too little funding. That led him to take a year-long sabbatical at Arizona State University’s Consortium for Science, Policy & Outcomes to research and write Rigor Mortis. It is his first book. PLEASE NOTE: This same day, Richard Harris will give a public lecture entitled Science Friction: What’s Slowing Progress in Biomedicine at 7pm in the Arnold and Mabel Beckman Center of the National Academies of Sciences and Engineering. For information on this lecture, see http://www.nasonline.org/programs/distinctive-voices/upcoming-events.html. The tickets are free and become available 7 days prior to the event.